One of the links below discusses how expensive houses are. I like my house, but when I think of all the money we have to put into the basement (it’s a complete disaster down there) and a new garage, it is a bit discouraging. 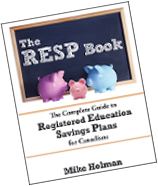 On a more positive note – I have finished the 2nd edition of The RESP Book. I hired an editor to check for grammar and typos and then I will do the formatting necessary for the printer. So my goal of a September release is still possible. The Wealthy Canadian (a brand new Canadian personal finance blog) breaks down his investment portfolio by sector. Go check it out and subscribe! My University Money wrote a funny inside look at financial literary programs for high school students. Worth a read. Scott Ronalds from Steadyhand reviews the ironically named “Manulife Simplicity Balanced Portfolio” fund. Simple it ain’t! Krystal Yee says that there is nothing wrong with not loving your job. Exactly – that’s why it’s called a “job”. Michael James explains how you can lose money on a leveraged ETF regardless of how the market performs. My friend Ruth talks about her Mom who passed away one year ago. A great tribute. Blunt Bean Counter discusses some of the pros and cons of buying vacation property in the United States. Canadian Business had a great article about why renting a house is better than buying. I like owning a house, but when I think of all the work involved and the huge sums of money we need to fix up our basement and garage, I have to question why we are doing this. Financial Uproar makes a great case as to why professional athletes are not overpaid. Jim Yih wrote a very good article about the new PRPPs and how they should look. The Oblivious Investor questions whether an emergency fund is essential for everyone. Some good points. Today’s Economy blog discusses the “Grand Experiment” taking place in a country near you. Boomer & Echo came up with several ways to save inside your TFSA. Million Dollar Journey talks about getting pre-approved for a mortgage. In retrospect, knocking the house down and building a new one would have been the sensible thing to do. However, that would have been a lot more expensive and there is no way we could have afforded it. Thanks very much for the link Mike. Looks like we’re in for quite a week. Good luck with the house Mike. Are you much of a handyman? I personally am not, but I have friends that are, and I don’t mind doing the lifting so it works out sometimes. Thanks for including me in the links! Glad you found my frustrated rant entertaining! Congrats, in advance, on the 2nd edition Mike. Great stuff. Geez, mortgage free next year? Wow. We have 15 more years to go. Thanks for the mention Mike, and good luck with the book. House expenses can be high, but I can still remember how annoying landlords can be. Thanks for the mention, Mike. I’m with Echo- just say screw it and buy a new house. It’s the lazy way out and I like it. Thanks for the mention. Any plans for the big long weekend? I gotta work, but at least I get Monday off. @Kevin – Yes, it will be interesting to see how the debt “default” plays out. @My Uni $$ – Yes, I can do work around the house, but I’m just not a fan of taking on big projects. I’m too busy with other stuff, so I only like doing small projects that can be finished in a short period of time. @MOA – Well, by next year I’ll have been a home owner for 12 years, so it’s not all that impressive. I really think that it shouldn’t take most middle class earners more than 15-20 years to be mortgage free. @Michael – So do I. I have no desire to rent again unless I want to be more mobile. They call it being a “home-moaner” for a reason! 🙂 Congrats on being mortgage free- I’m sure the renovations won’t be too bad- think of it as home improvement so that when you sell it down the road, it will increase the value of your home. Excellent, EXCELLENT article from Canadian Business. Makes me even more relieved that we sold (finally!) and are moving to a family-oriented townhome rental. We’ve been lucky to be able to sell at some profit, as London is starting to take a nosedive, and we’re going to be able to invest the money better (and more of it, too!) elsewhere. Thanks a lot for the mention and vote of confidence for my new blog. @Emily – Glad to hear your decision is working out. Previous post: What Are Pooled Registered Pension Plans (PRPP)? Next post: Will Social Security Payments Be Paid In August If United States Defaults On Debt?